Aging means changes in the way the body and mind work, but not every decline or shift is attributable to aging. Aging means changes in the way the body and mind work, but not every decline or shift is attributable to aging. It takes a doctor to diagnose Alzheimer's Disease, but it takes attention on your part to recognize warning signs in yourself or loved ones that warrant follow-up with a medical professional. If you really do have Alzheimer’s, acting quickly is important: the sooner you see your doctor about your concerns, the sooner you can begin treatments that may help slow the disease's progression. Below are five things to look out for. Those with Alzheimer's are more likely to struggle with communication and may have trouble following or joining a conversation. They may also stop in the middle of a conversation or they may repeat themselves, according to the Alzheimer’s Association, or call an object by the wrong name. People experiencing the impacts of aging may struggle with knowing what they want to say, but will likely exhibit less confusion than someone in the beginning stages of dementia. Occasional difficulty solving numerical problems or paying monthly bills can be expected as part of normal aging, but the key word is "occasional." Regular difficulty completing simple math equations, making familiar recipes or balancing customary budget items is not normal. Experiencing multiple issues of this kind or having difficulty with calculations you used to be able to do easily warrants follow-up with a professional. 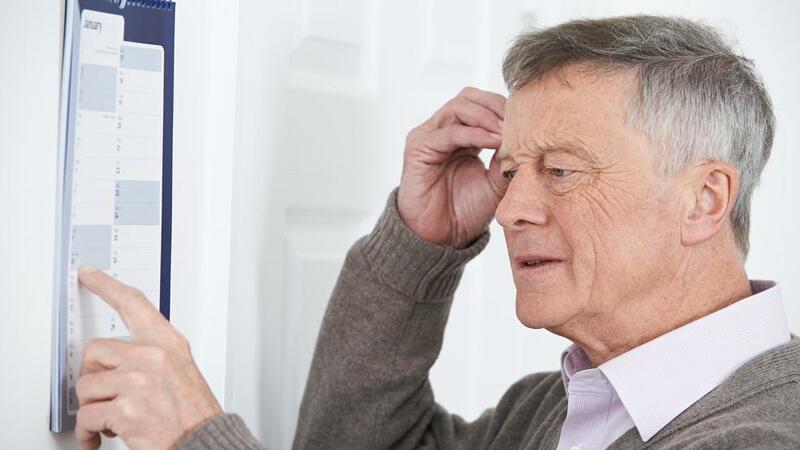 Inability to go about normal daily tasks due to memory loss is a key symptom of Alzheimer's. Normal forgetfulness that comes with age will not impair your ability to learn new information or cause you to ask the same questions repeatedly without realizing it. Alzheimer’s can do both and can also cause you to forget important dates or lead you to rely on family members to remember appointments and other important information. Most people find that they must stop participating in certain activities with age, whether because of physical fitness (as in downhill skiing or bike riding) or because of vision problems (no longer able to see well enough to drive). But certain skills shouldn't deteriorate with time, such as being able to work your oven or dishwasher, remembering how to get to a familiar location or using a simple phone. Cataracts are a normal part of aging, but vision problems related to spatial relationships might be a cause for concern. The Alzheimer's Association characterizes this symptom as someone who has difficulty "judging distance and determining color or contrast. In terms of perception, they may pass a mirror and think someone else is in the room," not realizing it is, in fact, a reflection. Speak with your primary care provider if you have questions or concerns about your mental or physical health. By being aware and proactive about your health and the health of those you love, you can guarantee the best care possible.